Acheson Creations has the next release out for their Kaiju-Kaos game. Say hello to Rokkjaw! 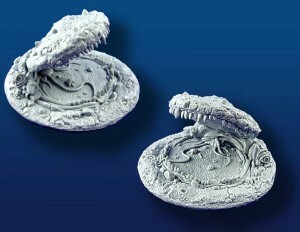 Acheson Creations announces the arrival of the next in their line of Kaiju Kaos products, the Rokkjaw, priced at $15.00USD (unpainted only at this time). Sculpted by Cline Siegenthaler, this figure is 7cm (3 inches) tall, with a 12.6cm (5 inches) diameter base, and is modeled in 28mm (1:56 scale). Rokkjaw is a giant, prehistoric rock monster. He is a member of the Everfolk and guardian of Earth, although his motives are usually self-serving. The Rift awoke Rokkjaw from his deep slumber and now the kaiju lies waiting for unsuspecting prey to feed upon. Rokkjaw cannot move on his own but can be carried and thrown as a boulder.